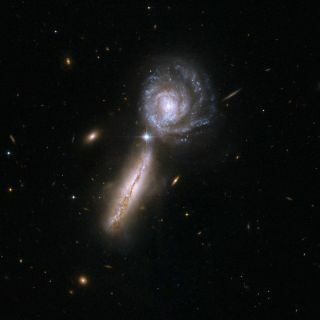 The spiral galaxies UGC 9618 and VV 340, which are about to collide. Astronomers believe such galaxy mergers also usually involve the merger of the supermassive black holes at galaxies’ cores. Such supermassive black holes lurk at the heart of most, if not all, galaxies, including our own Milky Way. Galaxy mergers are common throughout the universe, and astronomers think that such mashups usually involve the merger of the gigantic central black holes as well. So, in the new study, researchers took a different tack. They analyzed radio-wavelength observations of 33 sources of powerful jets, features commonly associated with supermassive black holes. In 24 of those sources, the team saw signs of "precession," or a change in the orientation of the axis of rotation. This came as a surprise, said study lead author Martin Krause, of the University of Hertfordshire in England. "We have studied the jets in different conditions for a long time with computer simulations," Krause said in a statement. "In this first systematic comparison to high-resolution radio maps of the most powerful radio sources, we were astonished to find signatures that were compatible with jet precession in three-quarters of the sources." This apparent precession signature is consistent with the existence of close-orbiting, or binary, supermassive black holes tugging on each other, study team members said. And this binary stage is likely not the final one but rather a precursor to a coming merger, they added. Detecting gravitational waves from these sources will likely be tough for the foreseeable future, the researchers wrote in the study, which was published today (Oct. 23) in the journal Monthly Notices of the Royal Astronomical Society. "Independent confirmation of our sub-parsec binary supermassive black hole candidates, and in fact any extragalactic jet source with some evidence for geodetic precession, via individual gravitational wave detections will be difficult," team members wrote. "Thus, improved modelling of the jet-environment interaction for precessing jet sources is probably the best way to better constrain powerful objects in the coming years." You can read a copy of the paper for free at the online preprint site arXiv.org.